While the world is waiting with bated breath for a glimpse of the Galaxy S IV from Samsung, it seems the Korean Phone manufacturer has been busy working on another device too. So what are they working on? Is it a Smartphone? Is it a Tablet? No, it’s a ‘phablet’! If you are inclined to believe in the rumors, that is. For the company is not telling us anything. Let’s see what this new device is. According some industry analysts, it will be the latest iteration of the Galaxy Note, the Note 3, though others beg to differ. It is likely to have a screen 5.9 inches in size, though again there are some who claim that it will sport a 6.3 inch screen. Of course, that does not seem very likely, and most agree that the new device will be a 5.9 incher. It will also be a progressive increase in size for the Note series which started at 5.3 inches and went on to become 5.5 inches for the Note 2. Therefore, 5.9 inches for the Note 3 is very plausible. The word is that the processor will be an 8 core Exynos 5 Octa chip with a chipset clocking in at a speed of 200 MHz. To keep abreast of the competition the new device is likely to feature full HD display. As far as connectivity is concerned, it is thought that the Note 3 will have 4 G LTE, Wi-Fi, Bluetooth and NFC. It will most probably feature a high MP camera, on par with the Galaxy S 4, according to people in the know. Seeing that the S 3 has an 8 MP camera, you can expect at least that much, if not more: a 13 MP camera. It is also expected that the latest version of the operating system from Google, dubbed Android 5.0 Key Lime Pie, will be preloaded on the device. As the new OS is expected to be rolled out in May this year, it gives Samsung engineers sufficient time to optimize it for the new phablet. The Galaxy Note 3 may have even more of the Galaxy S 4’s features like Smart Pause and Smart Scroll among others. 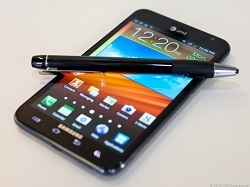 Samsung may include stylus support for the Note 3 too, and provide a refurbished S Pen. This expectation is based on Samsung’s interest in Wacomm stocks. Wacomm manufactures graphic tablets that utilize stylus input. After the lawsuit filed by Apple went against them, things seemed to get a little alarming for them. But the recent judgement that found the damages awarded to Apple excessive seems to have given Samsung a morale boost. Samsung seems to be strengthening its arsenal to take on the iPhone 5 and a possible iPhone 6, in addition to the iPad range of tablets. Of course, I don’t expect it to be as popular as the Galaxy S 4 of course, but Samsung looks like they want to give consumers a wide choice as alternatives for Apple’s devices. Will they succeed? I for one cannot wait to see! This is a guest post by Sofia Fern. She is a guest writer who writes more about digital cable and high speed internet. To get more information about cox cable , visit the site.